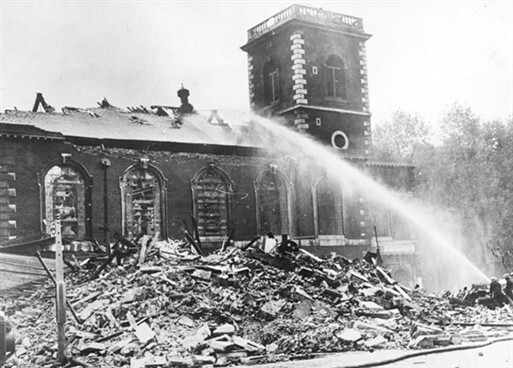 St James’s, Piccadilly was hit by high explosive and incendiary bombs during the first phase of the London Blitz. St James’s, an Anglican church facing Piccadilly and Jermyn Street, designed by Sir Christopher Wren and consecrated in 1684, was struck at 7.54pm, 14 October 1940. 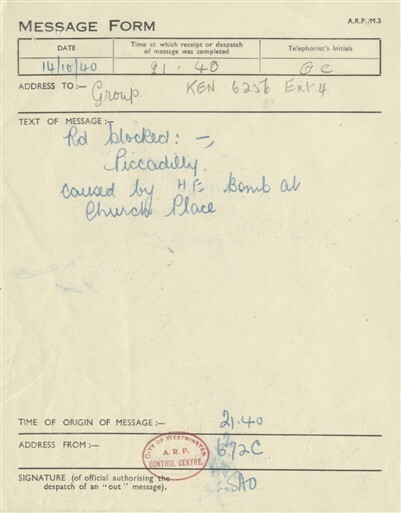 High explosive bombs fell on the eastern corner of the churchyard gardens and on Piccadilly itself, in the process demolishing the Vestry. The Rectory was also smashed to pieces, trapping the Verger and his wife in the kitchen beneath. 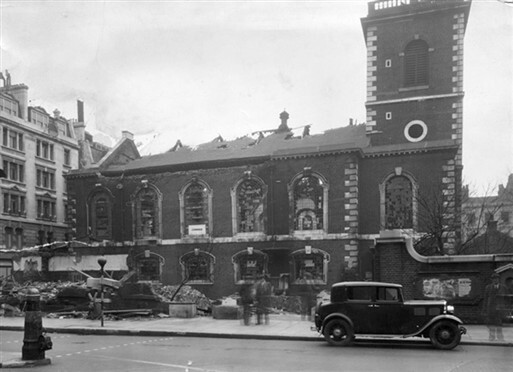 The blast severely weakened the Church’s brick and Portland Stone fabric: the north wall was fractured and pieces of shrapnel lacerated the building’s east end. The stained glass east window was blown out: fragmentation marks are still visible on the exterior Corinthian stone columns. Several incendiaries then hit the Church roof and set it ablaze. The burning roof, spacious vault and wooden gallery all collapsed. The interior of St James’s - pews, plasterwork, decorations, six rows of gallery piers and supporting Corinthian and Doric columns - was rapidly consumed by fire. Although the Tower survived, St James’s Gothic steeple toppled, crashing down with its two bells. Heavy debris fell onto the Church floor, causing major structural damage. The Verger of St James’s and his wife were trapped in the Rectory rubble for over twelve hours. Rescue teams were forced to drill through large blocks of stone and three thick masonry walls to reach them. Tragically, both died of their injuries. 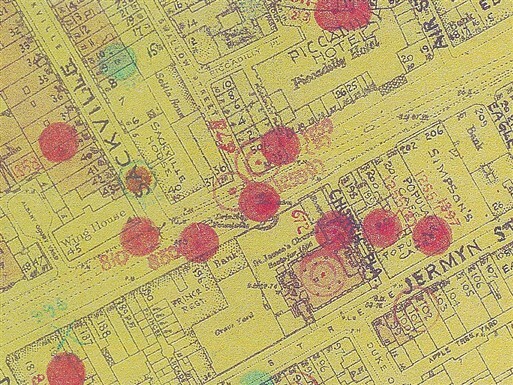 On the opposite side of Piccadilly – the road had been disfigured by a large bomb crater - a branch of the Fifty Shilling Tailor's chain was also struck by an incendiary at 8.15pm and caught fire. Molten wax tailors dummies fell into the street. 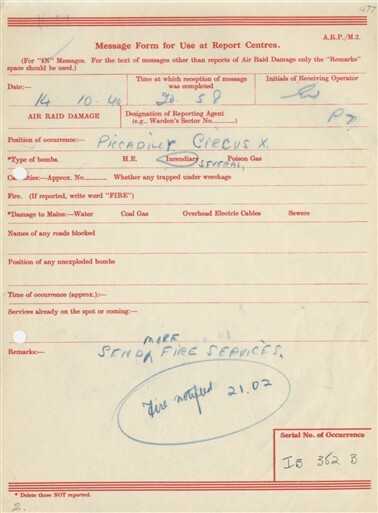 Nearby, the roofs of buildings around Piccadilly Circus glowed red with incendiary fires. When the smoke cleared, early on 15 October, St James’s was a burnt-out ruin, open to the elements. It remained a roofless shell for nearly seven years. 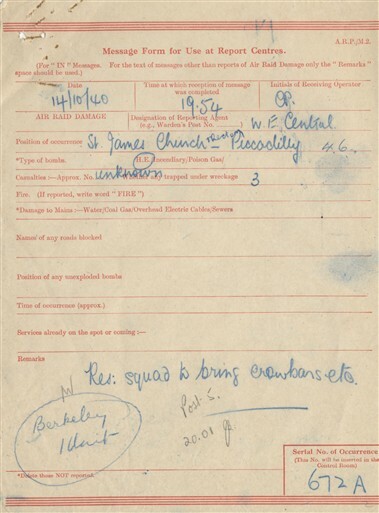 In 1941, services resumed after a temporary roof was constructed over parts of the south aisle. 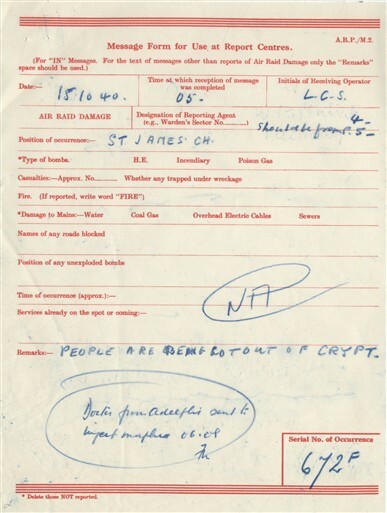 Air raid shelters were used in the Church gardens for the rest of the war. Major efforts to restore St James’s to its pre-war condition were not possible until 1946. In 1947, the architects’ firm of Richardson and E.A.S Houfe commenced St James’s painstaking restoration. The weakened north wall was buttressed and linked to its eastern counterpart. A new stone-dressed parapet and vestibule were completed together with replacement doors and a timber staircase to a brand new Church gallery. Fortunately, St James’s famous altar carvings, altar piece and organ casing had been protected prior to the raid and survived. 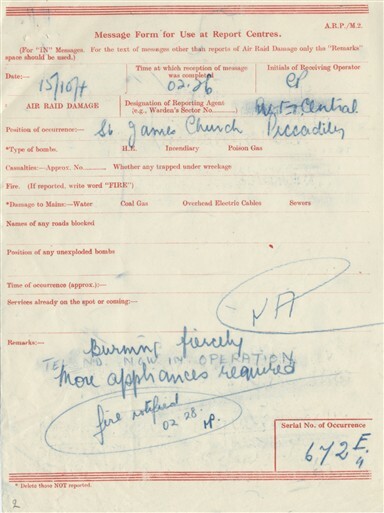 Likewise, air raid precautions taken by the staff ensured that the Church's marble font – used for the baptisms of poet and painter William Blake and 18th century Prime Minister, William Pitt the Elder - also emerged from the maelstrom of fire intact. After seven years of repairs, St James’s was rededicated by the Bishop of London in June 1954. The height of the Tower was reduced in 1955 and a new glass fibre spire completed in 1968. Today, the churchyard is dedicated as a garden of remembrance and St James’s continues to play its longstanding spiritual and pastoral role in the local Piccadilly community. Restoration of St James’s remains a constant obligation; in 2010 a new £3m renovation project is in progress. This page was added by Ronan Thomas on 09/09/2010.